This entry was posted in Social Issues and tagged Environmental justice, Environmental Racism on April 16, 2014 by Hadil Ayoub. Louisiana’s “Cancer Capitol” is the term that was deemed appropriate to describe Mossville; a small town found by Jim Moss, a former slave, and a town populated almost entirely by black people. The reason the Interfaith Center on Corporate Responsibility (ICCR) labeled it as such is because the small town is currently surrounded by fourteen chemical plants and industrial facilities that contribute on a daily basis to the town’s air, soil and water pollution. The town’s residents were found to be suffering from health issues as severe as cancer and serious learning disabilities to less sever ones such as rashes and breathing hardships. According to ICCR, these health concerns have been linked to the pollution caused by toxic chemicals. Recently, a new project to build one of the largest chemical plants in the country in this same area was proposed, if this were to happen, it is highly likely that Mossville will exist no more, and its residents will be forced to relocate. This entry was posted in Social Issues and tagged Environmental justice, Environmental Racism on April 2, 2014 by Hadil Ayoub. The Birth and Journey of a Movement: How the Environmental Justice Movement Became a Strong, Acknowledged Movement in the United States. This entry was posted in Social Issues and tagged Environmental justice, Environmental Racism on March 12, 2014 by Hadil Ayoub. 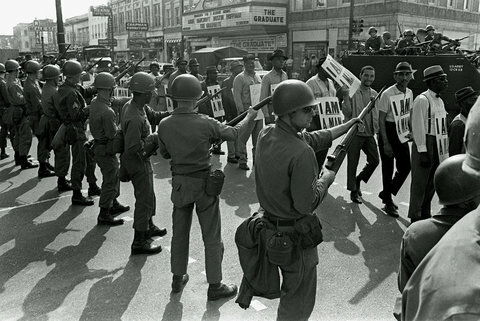 Striking Sanitation Workers and their Supporters surrounded by National Guard. March 29, 1968. This entry was posted in Social Issues and tagged Environmental justice, Environmental Racism on March 5, 2014 by Hadil Ayoub.